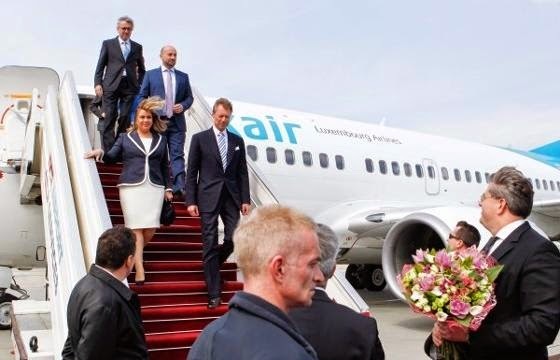 A very few hours later, the Grand Duke and Grand Duchess, looking super elegant in a rather simple outfit, arrived at the airport of Warsaw where they were greeted by Luxembourg's ambassador to Poland, Georges Faber, the chief of protocol of the Polish foreign ministry, Krzysztof Krajewski, as well as another few officials. 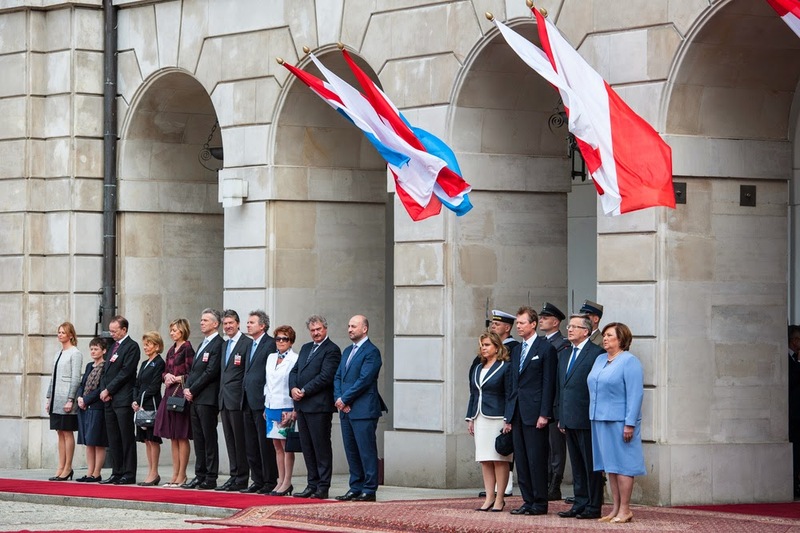 They then made their way to the Presidential Palace where they were welcomed by Polish President Bronisław Komorowski and his wife Anna Komorowska. 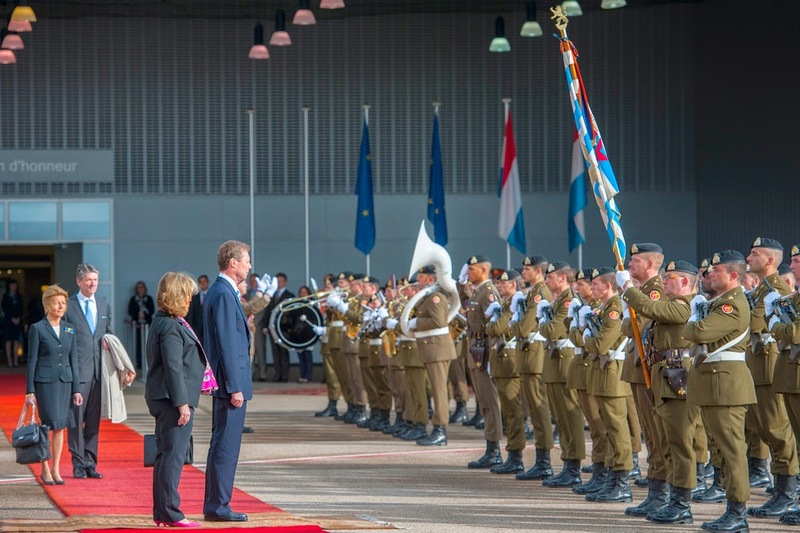 After the playing of both Luxembourg's and Poland's national anthems, the two head of states proceeded to action by inspecting the guard of honour in the courtyard of the home of the Palace. After an official reception inside the residence of the President of Poland, private meetings and talks were held between the different officials. The head of states and their wives then parted ways for some separate activities. 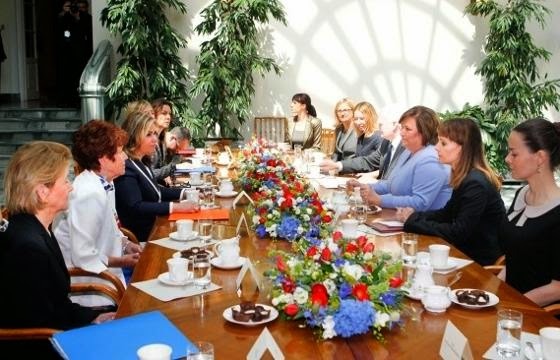 While the Grand Duke and the Polish President headed political talks, the Grand Duchess and Poland's first lady participated in some round table discussions about entrepreneurship and microfinance also attended by Polish businesswomen. 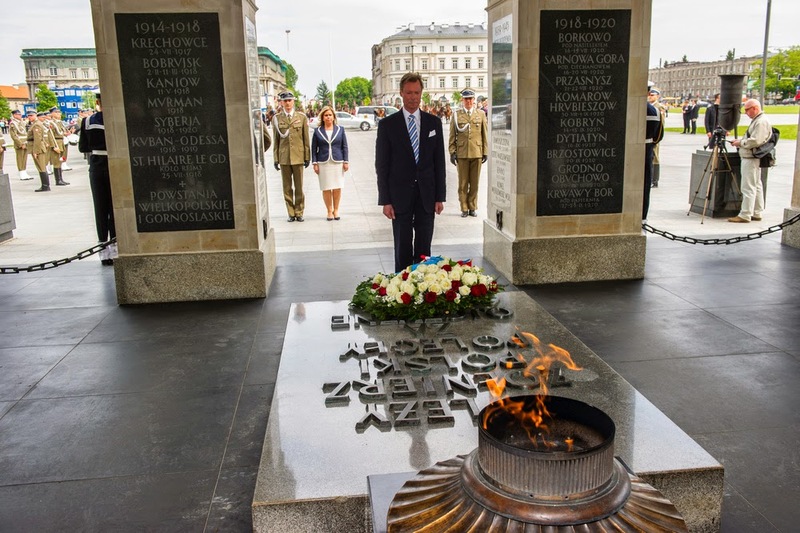 Grand Duke Henri, Grand Duchess Maria-Teresa as well as quite a number of soldiers then reunited to lay a wreath of flowers at the Tomb of the Unknown Soldier. Afterwards, they met up with the presidential couple again to have lunch together. During the course of the morning, the Grand Duke and Grand Duchess also exchanged various gifts including orders with Mr and Mrs Komorowski. 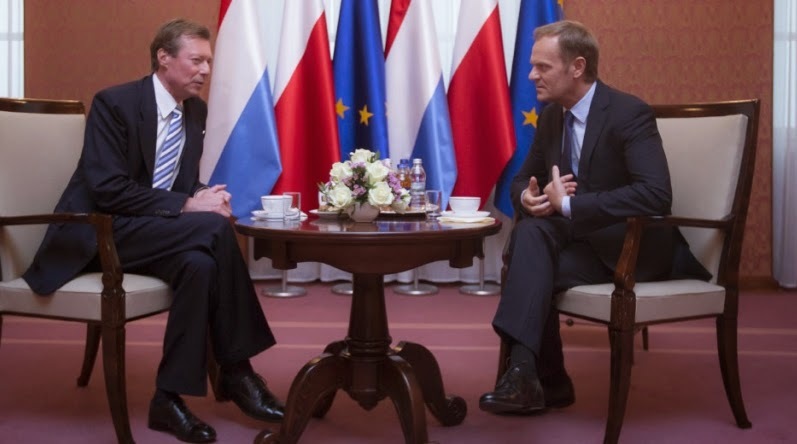 After luncheon, the Grand Duke and Grand Duchess met with different political leaders such as the Marshal of the Sejm, the lower house of the Polish parliament, Ewa Kopacz; the Marshal of the Senate, Bogdan Borusewicz; as well as Poland's Prime Minister Donald Tusk. Next up on the agenda was a concert in honour of Radio Luxembourg, which was very popular in Poland during the era of Communism. During the concert, renowned Polish musicians are giving performances of popular songs of the 1960's and 1970's. 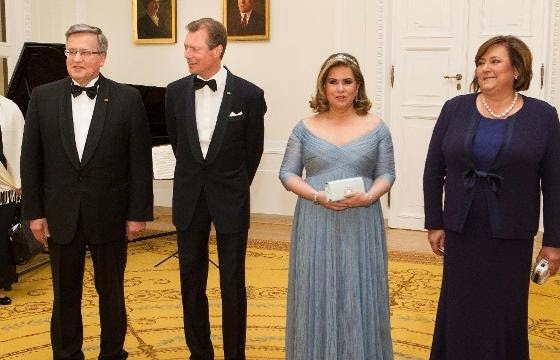 As one does, President Bronisław Komorowski and his wife hosted a gala dinner in honour of their Luxembourgish guests at the Presidential Palace in Warsaw to round off the day. While the Grand Duke was his usually dashing self, Grand Duchess Maria Teresa surprised at least me by getting a tiara out of the vaults after all. The gown look like Elie Saab to me but admittedly it's not my favourite. Both Team Luxarazzi and other people we've talked to feel like the dress looks familiar to us so we wouldn't discount the idea that the Grand Duchess has worn it before. More pictures of today can be found at Wort #1, Wort #2, the website of the Luxembourgish government, the website of the Polish President - Many thanks to our dear reader Ilona for sending in the link! -, the website of the Polish Prime Minister, the cour grand-ducale, Tageblatt, APA and RTL. P.S. Why not come over to The Royal Resource to talk about the state visit with us? I do love a surprise tiara! 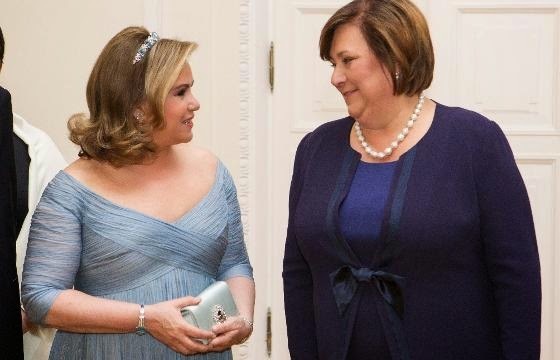 Also I really like Grand Duchess Maria Teresa's hairstyle even though I usually don't like tiaras with down or loose hair.